Q: I have seen some Really Badlooking Tail Extensions. Which Style of Tail Extension looks the Most Natural? A: This is probably the MOST asked question. 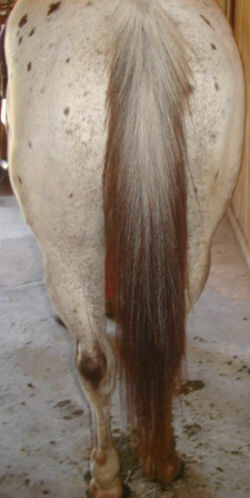 When you see a horse with a Really Bad looking tail extension this is usually because the rider has purchased a tail extension that is too short, the extension is not attached correctly or the style of extension chosen is not the best style for that particular horse’s tail type or the event it is competing in. To have a natural looking tail you need the correct style, the correct length of extension and the extension needs to be properly attached. Q: How do I determine which Style of Tail Extension would be best for MY horse? A: Some things to consider to help determine the best Style of Tail Extension for you and your Horse………. How long is your horse’s tail? Is it very thin? Does your horse tend to “use” or swish his tail? Does he carry his tail away from his body? What events do you compete in? Additionally, you need to consider your "show environment". Will you be attaching the extension by yourself or do you have a helper? Are you rushed trying to prepare your horse, your children and yourself? Are you new to using Tail Extensions? When you view our website you will see all the different styles of extensions that we sell listed on the left side of the page. Click on any of the styles and you will find a description of that extension and also our recommendations. If you’re still not sure, feel free to e-mail TheShowPen@aol.com or call us (614) 306-0845 and we will be happy to further assist you. Q: Why is it important to choose the correct length of Tail Extension for MY horse? A: To create the most natural look, your extension needs to be the proper length. This is especially important when purchasing a cap style (Tie-in, Slide-on ,Loop-on) Extension. Many times people will purchase Tail Extensions that are too short. In order to create length and volume, they attach the extension several inches below the tail bone which causes a whiplash effect as the horse moves down the rail. Q: How do I determine the length of Tail Extension MY horse needs? A: For Cap Style Extension ( Tie-in, Slide-on & Loop-on) measure the distance from the bottom of your horse’s tail bone to the point where you want the extension to end (usually the fetlock area). For Natural Loop and Triple Loop Style Extensions. Use the above measuring technique then add 2-3 inches. Hide Tail Extensions : Measure from about 1/3 of the way from the top of the dock to the point where you want the extension to end (usually the fetlock area). Q: How do I determine the weight of Tail Extension MY horse needs? A: This is often time a matter of personal preference. Most mature show horse’s will use a 1lb. extension. 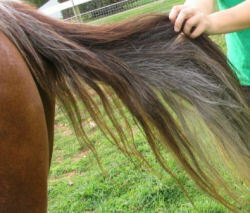 However, if your horse has a long tail, but just need some added volume at the bottom, you may only want ½ lb. extension. We also recommend ½ lb. extensions for younger halter horses and some lunge liners that would look un-natural in a heavier extension. A few horses need more than 1lb. so we also offer 1 1/2lb extensions. For those horses that need extra weight to help their tail set, our Triple Loop tail extension can be customized with up to 3lbs. of removable weight. Q: How do I determine the color of extension that MY horse needs? A: For some horses especially Bay's, Black’s and many Sorrels this is easy because they have solid color tails but for horses with multiple shades, the rule of thumb is to match the predominate color of the hair where you are attaching the extension. See some examples below. portion of the tail is sorrel. For this horse, we would match the sorrel color. top and gets lighter as you go down the tail. match the light gray color. the top of the tail bone, we would use a darker gray color. Looking at this sorrel horse you can see that he has lighter hair on the top and then it get darker as you go down. If we are using a style of extension that attaches toward the bottom of the tail bone Natural Loop, or Wrap-around we would match the darker sorrel color. But this is what confuses a lot of people......if you look in the very center of the tail you will often times see a mix of white, and gray hairs. We DO NOT want to match this color because it is not visible unless the tail is separated in this manner. Natural Loop, Triple Loop, Wrap-around and Cap Style Extensions( Tie-in, Slide-on & Loop-on), match the predominate color that is toward the bottom of the tail. If you’re NOT SURE of the color you need SEND US A SAMPLE and we will match it for you. Remember you want to take your sample from the area where you will be attaching the extension. Q: I don’t want my horse to step on his tail. What can I do to help avoid this? A. Anytime you are not in the show ring it is a good idea to keep your tail loosely braided and in a tail bag or sock. When your tail is down. DO NOT “train” on your horse making him back quickly and DO NOT turn your horse loose in his stall. Q: Opps….. My horse stepped on his extension and it broke. What do I do now? A: We offer low cost Repairs on all of our extensions. So first thing Monday morning simply drop the extension in the mail to us and we will repair it. Most repairs can be made very quickly. However please note, our Natural Loop extensions may on some occasions need to be returned to the manufacturer for repair. This may take several weeks. If you have any questions about the length of time your repair will take, please contact us.